Seoul restaurant Eun-Ho Sikdang, is located in Namdaemun market. Eun-Ho Sikdang, founded over 70 years ago, is located in the center of Namdaemun market.The traditonal local restaurant is open 24 hours and popular among local citizens as well as the marchants in the market, and introduced on a cooking program.The restaurant only provides various dishes with beef. Their soups and stews are made of lots of cuts of beef. 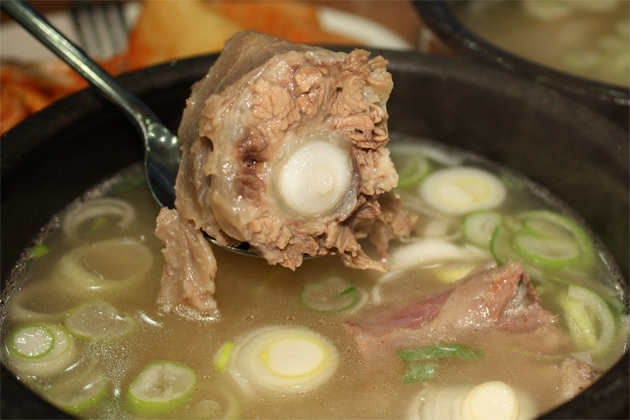 The popular menu is Kkori gomtang, oxtail soup. Kkori gomtang is oxtail soup. This well-boiled soup has now raw smell and meat is very tender so it’s easy to eat. Oxtails are very special cuts of beef and one oxtail can be cook for the only one dish. As Dogani tang, a soup of beef knee catilage, contains a lof of collagen, so it is said to be effective in healthy skin.